Bring a fry-pan or small pot to medium-high heat. 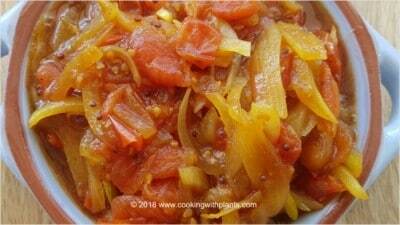 Add the tomatoes and onions and stir until they start to soften. Add a splash of water if you need to stop them sticking. Add the garlic, mustard seeds and curry powder and stir for another minute or so. Add the sugar (or raisins) and stir for about 30 seconds until it’s well stirred through the mixture. Add the salt and apple cider vinegar and give everything a final stir through so that it is well combined. Turn the heat to low and let your mixture simmer for 20 minutes to half an hour until it is nice and soft and broken down into a delicious relish. Serve hot or cold and store in the fridge for up to a week in a container. Enjoy! Great served with my Hearty Mushroom Lentil Burgers. If you make this recipe, please take photos and share them on my Instagram page or in the Cooking with plants facebook group I would love to see your creations!